Definition and Summary: The Great Chicago Fire, also referred to as the Chicago Fire of 1871, burned from October 8 to October 10, 1871. Many of the houses in Chicago at this time were made of wood and the blaze spread wildly across the city. The Great Chicago Fire left an estimated 300 people dead and over 100,000 people homeless. More than 17,000 structures were destroyed and damages were estimated at $200 million dollars. Legend tells that the blaze was caused by a woman who knocked over a lighted kerosene lamp whilst she was milking a cow. 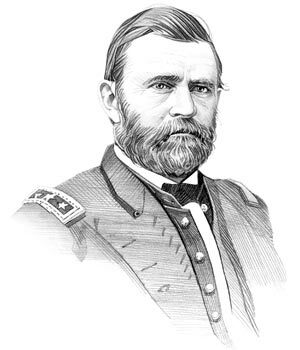 Ulysses Grant was the 18th American President who served in office from March 4, 1869 to March 4, 1877. One of the disastrous events during his presidency was the Great Chicago Fire of 1871. Legend tells that the cause of the Great Chicago Fire in the early morning of October, 1871 was due to an accident involving a woman called Mrs. O'Leary and a cow. This famous legend tells that Mrs. O'Leary went to the barn in the early morning, when it was still dark, to milk her cow. Mrs. O'Leary carried a lighted kerosene lamp - and the cow kicked over the lamp. The barn was soon ablaze and a tempestuous gale carried the burning sparks from one house to another across the Windy City. The Great fire went on spreading all that day and night and continued into the next day. Nearly $200 million dollars worth of property was destroyed in the Great Chicago Fire and homes of nearly 100,000 people were burned down. Legend tells that the cause of the Great Chicago Fire was due to Mrs. O'Leary, the lighted kerosene lamp and the cow. However, following the blaze an investigation was held in November and December of 1871 by the Chicago Board of Police and Fire Commissioners - but they were unable to determine the exact cause. The enquiry involved interviewing over 50 people but the conclusion of the report was that report that "whether it originated from a spark blown from a chimney on that windy night, or was set on fire by human agency, we are unable to determine." The main people believed to be involved in the cause of the Great Chicago Fire were Mrs. Catherine O'Leary, an Irish immigrant, and her husband Patrick "Peg Leg" Sullivan who both strenuously denied causing the blaze. Another person involved was Dennis Regan, a neighbor, who tried to put the fire out with Daniel Sullivan. Ironically the O’Leary property survived the blaze. In 1997, the Chicago City Council passed a resolution acquitting Catherine O’Leary and her cow. Interesting Great Fire facts for kids are detailed below. The history of Great Fire of 1871 is told in a factual sequence consisting of a series of short facts providing a simple method of relating the history and events of the Great Fire of 1871. Great Chicago Fire Fact 2: The blaze began in a barn located on the property of Patrick and Catherine O’Leary at 137 DeKoven Street on the southwest side of the city. Great Chicago Fire Fact 5: The terrible blaze destroyed 17,000 structures, including the business district of the city, damages were estimated at $200 million dollars. Great Chicago Fire Fact 6: An estimated 300 people were killed in the blaze and over 100,000 people were left homeless. Great Chicago Fire Fact 7: It was one of the largest U.S. disasters of the 19th century. On the same day that the Great Chicago Fire began, another terrible fire broke out in Peshtigo, Wisconsin, in which nearly 1,000 people perished. Great Chicago Fire Fact 8: At the time of the blaze the population of the city was approximately 324,000, it was the second largest city in the United States. Nearly one third of the people were left homeless. Great Chicago Fire Fact 9: The blaze caused pandemonium and there were many instances of theft and looting in the city. Great Chicago Fire Fact 10: The chaos and crime in the Windy City resulted in martial law being declared on October 11, 1871 which was not lifted several weeks later. Interesting history and the 1871 Great Fire Facts for kids are continued below. Great Chicago Fire Fact 14: The blaze and windy conditions produced a terrifying fire whirl (aka a fire devil, fire tornado, or firenado) which added to the panic in the city. Great Chicago Fire Fact 15: In November and December of 1871 the Board of Police and Fire Commissioners held an inquiry. 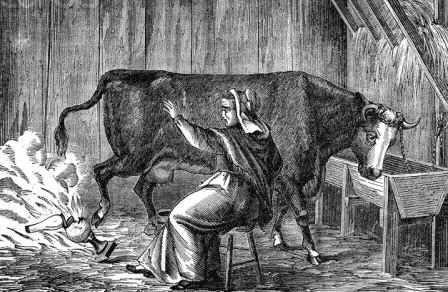 Great Chicago Fire Fact 17: The legend of the cow started in the Chicago Evening Journal of October 9, 1871 when an article was printed claiming that the fire was caused by "a cow kicking over a lamp in a stable in which a woman was milking." Great Chicago Fire Fact 18: The cow and kerosene lamp story puts the blame on Catherine O’Leary. She was the perfect scapegoat for the cause of the blaze because she was a poor, Irish Catholic immigrant. Great Chicago Fire Fact 19: In 1997, the Chicago City Council passed a resolution acquitting Catherine O’Leary and her cow. Great Chicago Fire Fact 20: The disastrous blaze will never be forgotten as the modern training academy of the Chicago Fire Dept. is located on the site of the O’Leary property where the Great Chicago Fire began. The article on the Great Chicago Fire provides an overview of one of the Important issues of his presidential term in office. The following Ulysses Grant video will give you additional important facts and dates about the political events experienced by the 18th American President whose presidency spanned from March 4, 1869 to March 4, 1877.